Seals and sea lions can no longer be ignored in the effort to recover our threatened Puget Sound chinook salmon or our endangered killer whales. 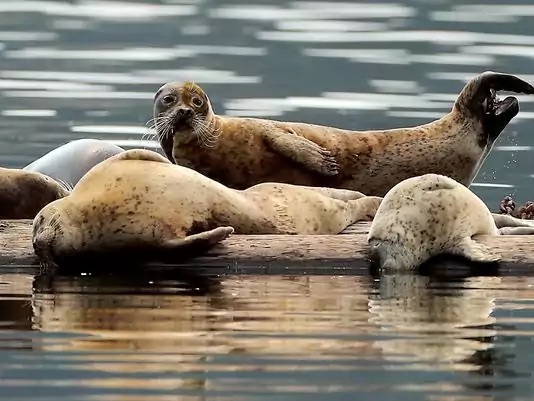 A new study shows that seals and sea lions are eating about 1.4 million pounds of Puget Sound chinook each year — about nine times more than they were eating in 1970, according to the report. Please read the story I wrote for the Encyclopedia of Puget Sound, also published in an abridged version in the Kitsap Sun. Seals and sea lions in Puget Sound get the first chance to catch the chinook as they leave the streams and head out to the ocean. Since they are eaten at a very young age, these small chinook, called “smolts,” never grow into adults; they never become available for killer whales or humans. Based on rough estimates, as many as one in five of these young fish are getting eaten on their way out of Puget Sound. If they were to survive the seals and sea lions and one factors in the remaining mortality rate, these fish could translate into an average of 162,000 adult chinook each year. That’s twice the number eaten by killer whales and roughly six times as many as caught in Puget Sound by tribal, commercial and recreational fishers combined, according to the study.